Lucas Jervies, the choreographer of our new Spartacus, talks to Kate Scott about why classical ballet is his first love, how our dancers shape his work, where he gets his ideas from and why he likes to play Whitney Houston in the studio. As someone who moves between classical and contemporary dance, do you ever find the pointe shoe strange? No! I come from ballet – that was my first love and my first experience of dance, so there’s a comfort every time I step back into that world. I may improvise something, however, and then have to check in with the dancer: “Oh, can you actually do that?” After I ask them once or twice, they understand it’s up to them to interpret the step for the pointe shoe. My choreography is predominantly gender-neutral, but in the classical ballet vocabulary you’re working with pointe shoes and the fundamentals of a gendered technique. I’m still learning how to blur the gender lines within the classical language. Aside from the score you’re working with, what kind of music do you listen to when you’re creating? House music. I just love the drive of house music: it’s very inspiring and energising. And as a child of the 80s, I also might put on something like Whitney Houston or Michael Jackson the first day I’m working with dancers in the studio. It just lightens up the room before we dive into the heavier and more physical hard work. It catches the dancers off-guard and gets a giggle. Is there anything more terrifying than that first day in the studio? No. Day one and opening night are terrifying bookends. I try to be as prepared as possible, but you need space for the dancers to contribute, otherwise it's pretty boring. The days of an authoritarian choreographer are long gone: dialogue is much more interesting and produces better work. The big ones are Pina Bausch, William Forsythe and Jiří Kylián. I've worked closely with Georg Reischl, who was a protégé of Forsythe’s, and Marco Goecke, who is an associate choreographer at Nederlands Dans Theater. They both influenced deeply how I look at ballet technique and contemporary dance. Working on Rites with Bangarra Dance Theatre’s choreographer Stephen Page when I was a dancer with The Australian Ballet, and seeing the intricacy of his footwork and legwork, left a mark on how I use the lower body. That said, dancers are probably the biggest influence on my work. Does your cast have a large bearing on the final texture of the work onstage? Absolutely, 100%. Every dancer is a muse, and over my career those muses have influenced me both immediately and over a longer period. At the beginning of creating Spartacus, I had very clear ideas of what I wanted to explore, but that changed on a daily basis once I had dancers in front of me. 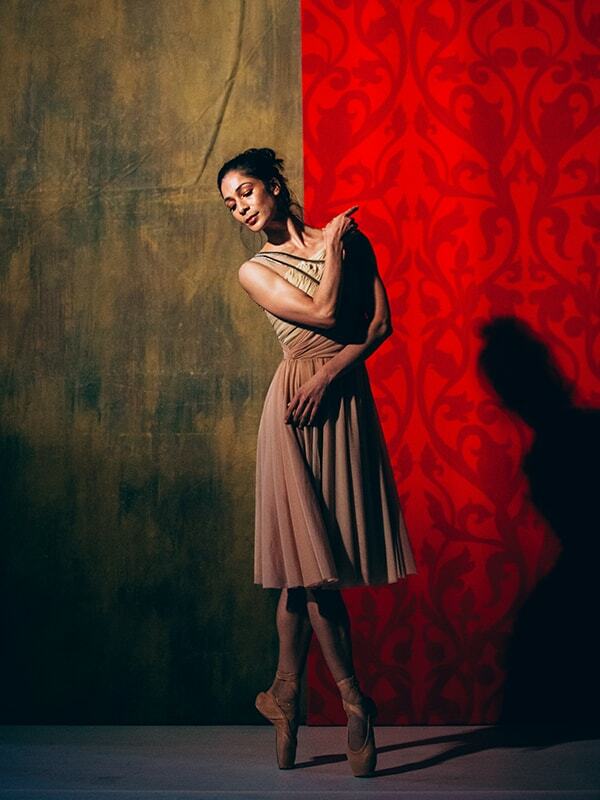 Robyn Hendricks, for example, is a real ballerina, and I mean that with total respect and admiration. Everything I threw at her came back pure and refined – stunning. So I was able to push things further to introduce that conflict; it made things interesting. Through Robyn, the choreography really evolved. Is it hard to let go of certain ideas or steps that you might love, but ultimately don’t serve the larger ballet? “Kill your darlings” is the famous phrase, isn’t it? Yes, I have a really hard time accepting that’s what I have to do sometimes. That said, in my real life I love throwing things away. I don’t own furniture, and because I’ve been on the road for 20 years, I can pack a suitcase and be anywhere. It can be difficult cutting something from my work, but the second it’s gone there’s a feeling of total freedom. Are there any periods of ballet history you wish you could time travel back to? Be a fly on the studio wall? Probably the 1990s, to observe William Forsythe at work. I think it’s one of the most interesting periods for dancers and dancemakers. All the other progressions and changes in form that happened up until then were subtle, and then Forsythe just went ‘Bam!’ But it all came from the classical technique; he was very specific about that. He’s still making great work, but I would have loved to be part of that great leap. More time travel: if you could whisper any advice into the ear of your teenaged self, just as you graduated from The Australian Ballet School, what would it be? Patience. I wish I’d had a little bit more patience in my early career. When I got into The Australian Ballet, it was the first time I’d had a job, had a paycheck, the first time I’d travelled, and the first time I’d really got to make my own decisions. It was sometimes difficult to navigate those things alongside the discipline that’s required of a professional dancer, but I had big ideas and ambitions. I was always wanting the next thing, but I wish I had calmed down a little bit and enjoyed that time for what it was. What are some of the most unusual places your journey as an artist as taken you? Well, I worked as a drag queen on Mykonos for seven weeks in 2003, which was wild and fun. Dancers work hard to maintain a healthy lifestyle so they can perform at their best. Does the same go for choreographers? I certainly go into it with that objective! Something as big and intense as Spartacus can be all-consuming, and I’m still learning how to balance all that out. But I have just joined a yoga studio. Some people talk about getting their best ideas in the shower, or on the walk to work. Do you have that experience? It’s all those places: in bed, in a restaurant, out dancing at a club. I’ll often excuse myself to jot down notes on my phone. It’s those random places, because that’s where you’re relaxed. So I try to foster that relaxed mode in the studio, which is why the Whitney comes out. When people let their guard down, interesting stuff happens.